LA PORTE, Ind. 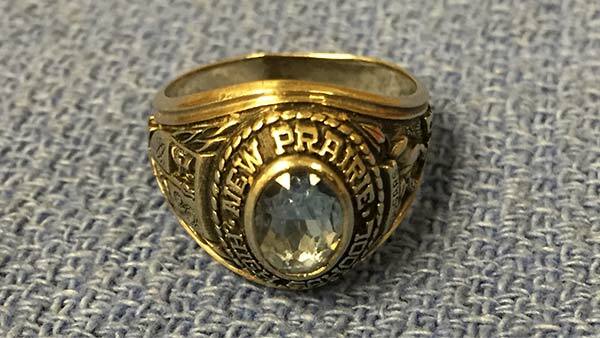 (WLS) -- A class ring believed to have been stolen over 10 years ago will be returned to its owner after a La Porte County detective tracked her down following an evidence purge. Detective Mike Raymer, who maintains the La Porte County Sheriff's Office evidence room, was reorganizing the room while updating files and cases when he found a box containing a New Prairie High School class ring. The ring was part of what is believed to be recovered stolen property, mostly costume jewelry, which had never been claimed by an owner. Detective Raymer found a name, Diane Mills, inscribed inside the ring and was able to use that name to get a date of birth from the school. He was then able to use a law enforcement tool to locate Mills, now married with the last name DeMeyer, in rural northeast La Porte County. Raymer reached out to DeMeyer to arrange a meeting and return the ring to her later this week. DeMeyer told the Sheriff's Office she believes the ring may have been taken when her parent's home was burglarized over 10 years ago.